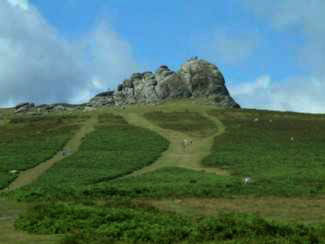 The Templer Way runs for 18 miles from Haytor to Teignmouth. The trail is well waymarked. 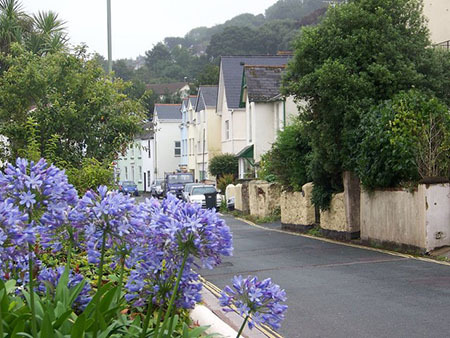 Landscapes change from wild moorland to delightful wooded areas and peaceful countryside down to the Teignmouth estuary. © Copyright Neil Kennedy and licensed for reuse under this Creative Commons Licence. Depends on which way one takes The Templer Way as it whether it is difficult or not! From Haytor to the sea it is easy as it is downhill all the way. If you are fit try the reverse journey! Named for the Templer family it celebrates Devon's industrial past. James Templer built the Stover Canal around 1800. He wanted to export Devon clay. His son George Templer continued this tradition by building the Haytor Granite Tramway to the canal to carry granite for London's famous landmarks, London Bridge, the British Museum and the National Gallery. The Templer Way starts at Haytor. Climb to the top of this popular landmark for wonderful views and camera shots. On a good day you can almost see the coast. Wow! 360 degree stunning views. You will kick yourself if you have forgotten your camcorder. If you cannot climb and your camera is itching, the tor itself makes a good shot as do the local ponies. The disused quarry you can see is the stone that built those London landmarks. Those tram tracks are George Templer's tramway to the canal and are the start of the trail. Open moorland beckons towards those superb views. Walking on down The Templer Way moorland retreats and woods and downs appear adapting to farmland as Pottery Pond approaches. Pottery Pond, a peaceful spot full of wildlife and a pleasant place for a stop. There are seats for serene contemplation. Children can feed the wildfowl. The pond was built in the 1700's for a water supply to run the machinery at Bovey Tracey Potteries nearby, hence the name. No longer needed for that purpose the wildlife love it. 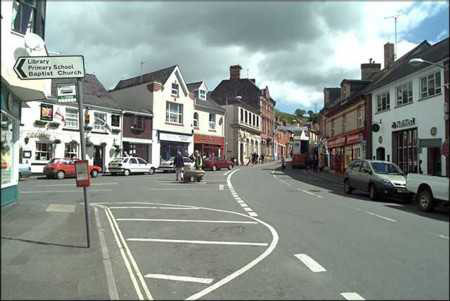 Bovey Tracey – known as a gateway to Dartmoor. As a Saxon settlement in the sixth century it was known as Boffa. Both the town and the river Bovey are probably derivations of this name. Tracey comes from the de Tracey family who were given land here after the Norman Conquest. William de Tracey rebuilt the original 5th century church as penance for assisting in the murder of Thomas a Becket in 1170 and it is St Peter, St Paul and St Thomas of Canterbury. The current church dates from a couple of centuries later. William de Tracey also built the Manor House in East Street. © Copyright Mike Crowe and licensed for reuse under this Creative Commons Licence. A Fair and Market Charter was given to the town by Henry III and there is still a Farmer's Market every second Saturday. A battle between the Royalists and the Roundheads occurred at Bovey Heath during the Civil War in 1646 which the Roundheads won. Significant Civil War finds have been made there and the site is now a Scheduled Ancient monument. Bovey Tracey's important pottery past can be traced at the museum - The House of Marbles. The museum has the largest collection of marbles in the world and a glass blowing centre as well. Pottery is still being made locally. Lovers of The Antiques Roadshow will know of Bovey Tracey pottery. Granite is a building material for this town not surprisingly, but cob is also used. A thatched building “Church Steps” near the church dates from the late 1400's. The old station was restored and is now occupied by the Heritage Trust. Moving on The Templer Way reveals a level stretch of walking leading first of all through The Great Plantation, a popular walk with the locals as well. From here the Trail passes through more woodland until it wanders through Stover Country Park. 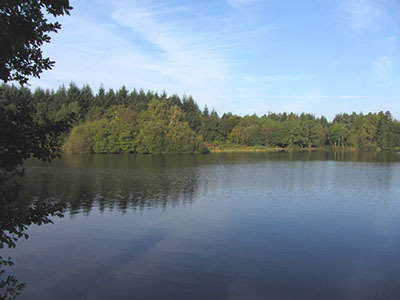 A most beautiful area of woods, lake and wildlife. This area has been designated a Site of Special Scientific Interest because 21 rare dragonfly species are found there. The Park is now on the register of Historic Parks and Gardens and declared a Nature Reserve also. James Templer built Stover Park as a Palladian style stately home with his own granite from the estate, landscaped the grounds and constructed the tranquil 10 acre lake. Improved by the Duke of Somerset and then owned by the Forestry Commission, Devon County Council bought it in 1979 and have turned it into a wonderful 114 acre wildlife heaven. An intriguing addition to the park is the Poetry Trail of Ted Hughes best loved nature poetry. Ted Hughes loved Devon and lived in the county for many years. 16 posts have been placed around the trail each one displaying one of his poems - “An Otter”, “A Cormorant” “The Thoughtfox” “Trees” etc – even very appropriately “The Dragonfly” There is a children's trail with a big story tellers chair. The Poetry trail is a captivating reflection of nature, just seems to belong. Very environmentally friendly, the Visitor and Interpretation Centre is heated and cooled by geothermal energy from the lake in the park. This bit of technology is a geothermal heat pump passing water through a closed loop of plastic pipe in the middle of the lake. It absorbs heat in the winter and rejects it from the building in the summer. No regular servicing, no emissions, no gas or oil required. Did not cost much either as these things go. Handy. Now The Templer Way divides – one path cross country, the other following the Teign. Actually they can be walked round as a circuit for an extended walk, or just a stroll within a day out at Stover Park. The canal itself is 1.7 miles long and flows to Jetty Marsh. It was built by James Templer the second to transport ball clay for the growing pottery market. At that time potters such as Josiah Wedgwood were experimenting with pottery clays and producing superior products. George Templer's granite was transported along the canal on its journey to London. On to Newton Abbot along the route of the Stover Canal. Historic locks now in ruins stir the imagination of the scenes on the canals as it used to be. Heavily laden barges hauled by men moved labouriously along the well trodden towpath. Some barges had a sail. 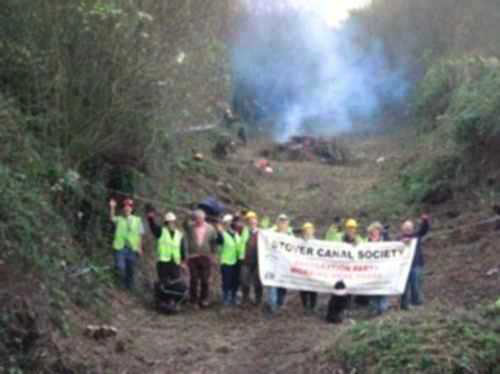 The Stover Canal Society are doing sterling work restoring this canal. The tower standing all on its own in Newton Abbot is all that remains of the one time parish church of St Leonard's. The church itself was built in the middle of the fourteenth century but the rest was pulled down in 1836. Newton Abbot can lay claim to being visited by two kings at the beginning of their reign. Both stayed at Forde House a Jacobean mansion dating from 1610. Charles I in 1625, the year he came to the throne. He was on his way to inspect the fleet at Plymouth at the time. He returned a few days later for a couple of nights. A most historic moment – In 1688 William III read his very first declaration of his intention to become King of England after he arrived from Holland. There is a plaque next to the tower that marks the spot. Oliver Cromwell and the able Roundhead commander, Thomas Fairfax, stayed at Forde House in January 1646. They were intending to capture Dartmouth and did so. Forde House is now used as a venue for conferences and weddings. Well worth a visit - Bradley Manor is owned by the National Trust. Set in a beautiful woodland and riverside surroundings the medieval manor is superb. Take a picnic, there is no shop on site. Newton Abbot has its very own traditional malthouse. Tuckers Maltings is still a highly productive, working malthouse. Open to the public with hourly tours from Easter to October. An annual Beer Festival is held here during April. Nearly forty breweries bring about 140 different ales to taste. The Templer Way now follows along the edge of the Teign estuary on its way to Combeinteignhead and Shaldon. Time your walk - A word of warning – the walk along the estuary can only be undertaken within two hours either side of low tide. Contact the Tourist Information Centre for details of tides and access. Walking is level but a bit tiring – rocks and slippery mud at low tide. Combeinteignhead is a small attractive hamlet and a conservation area. Its history goes back centuries as can be seen by the cob and thatch houses. The almhouses were built by the Earl of Bath in 1620, however they had other uses over the years and were at different times both a tavern and a school. 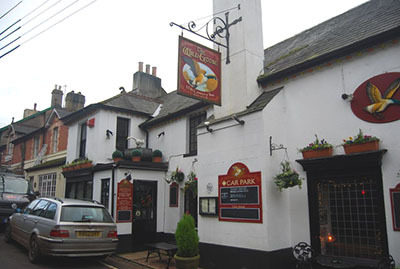 There are two famous pubs, the “Wild Goose” built in the 1600's in the middle of the hamlet and “Coombe Cellars” on the estuary which was once a haunt for smugglers. The ancient church is also worth a visit. Shaldon is arguably one of the prettiest villages in England and certainly in Devon. Houses date back to the 1600's and its sister village of Ringmore has houses even older. Set on the estuary Shaldon sits under the headland that has guided their seaman home for centuries. Ringmore is sheltered and upstream in a lovely fertile valley. Shaldon is certainly a thriving place with village shops and five pubs. A ferry takes passengers across the estuary to Teignmouth and the end of The Templer Way. Or if you prefer you may wish to browse some more, please do, there are navigation buttons above on the left.